When purchasing a house in India, where laws and regulations can be gray, it is a given that dicey situations are lurking. 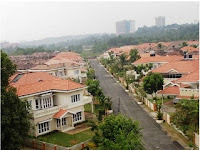 We shadowed our cousin’s detailed research about six years ago and inked the deal on a villa project very close to the Infopark in Kakkanad (Kerala, India). Thanks to her research, we are blessed with a premium location! In the wake of the real-estate boom in Kerala, builders have mushroomed and purists consider our builder (Heera Constructions), though well known, a notch below premium local builders. It is best to designate someone to work with the builders while construction is in progress, for unlike in the US, most villa projects provide options to alter construction based on a generic plan. It is also possible to remotely coordinate without a middleman as builders are used to working with NRI’s. With most builders, the quoted price (per square foot rate + statutory and other charges) is for the shell with a single-coat of paint and basic landscaping. Builders however encourage upgrading via them to make the house livable. Though we refrained, we highly recommend this option, as it allows the flexibility to be hands-off with a single point of contact. Upgrading through the builders is slightly more expensive but the alternatives are not much fun either: be a renter till interior decoration is completed or move in as-is and get the upgrades done. We chose the latter approach which while economical was painful. To our builder’s credit, our community had the luxury of water and electricity from day one. Water connection from Kerala Water Authority (KWA) was a work in progress but they had an RO plant and some wells to ensure water supply. In peak summer, the community purchases water by the truckload to contain needs. KWA connections are slowly getting done at all the villas, although receiving water is still to become a reality. KWA pumps water twice a week to the area, but most houses are yet to receive a single drop of water – it is fishy and there is speculation that it is based on some understanding between private water suppliers and KWA valve operators. Sunshades: For aesthetic appeal, the sunshades atop the windows and the roof resembled a shallow tank with drainage vent on one side. That design with inadequate slope allowed water to collect and leak into the walls. Newer designs of a sloping thin slab would have been a better option. We added sloping wherever required and waterproofed throughout. Another alternative is to keep the existing structure and add a sloping tile roof to the parapets. Open Balconies: Our house had three sit-out areas upstairs. While aesthetically pleasing, water came pouring in during the monsoon. Most homeowners had to cover these patios in some way. Termite/Pest Control: While the literature promised termite treatment after constructing the basement, it did not seem effective at all and pest proofing was not even promised. This translated to the owners doing these messy processes after handover. The former involves drilling holes into the structure generating a lot of dust, not to mention the fumes from the liquid injected to kill the termites. The latter involves misting the walls throughout – a health hazard. Fumigation seems to be unheard of. Roof tile work that drained to a channel within the roof structure: Rain falling on the tiles atop the roof drained to the inside of the concrete roofing and then drained down via the down spouts. The design is flawed for it did not consider water leaking through the roof due to blocked drainage or inadequate sloping or broken tiles. Underground Water Pipes: As these buildings were constructed on landfill, a certain level of settling was to be expected. These underground water-pipes were a bad idea as many homeowners experienced pipe breakage. As a preventive measure we invested in cutting the underground portions off and brought the pipes up. Landscaping: Lawns were standard in the front but no drip irrigation facilities were provided. Given the water shortage, the idea of supplying villas with water-intensive lawns was a poor choice. Water: Although our builder invested in an RO plant, the capacity was enough only for a fraction of the villas constructed. Inadequate water is an on-going problem that needs to be addressed. To summarize, buying into a new villa project in Kochi is very different from purchasing a new construction home in a developed country. In the shell given at Kochi, time, energy, and resources are required before it can be called a home.